I've not been having a great time lately. I've been moody, and I got two book rejections in quick succession which has knocked my confidence. I'm still going, though, because I know my new book is worth it, and there are countless reasons beyond it just being bad that can get it rejected - timing being a huge factor. I just have to keep plugging away. I only need one 'yes'. But I've not been as cheerful and I feel a migraine looming. And the fact that it's almost Valentine's Day isn't much to cheer me up as Seeg and I don't really do anything with it, as I said in a recent post, which I am fine with, but when it starts to roll around, the single teenager in me starts rearing her pudgy head and I can get a little upset. But I learned long ago that he is not a mind reader, so though I do lay down hints that don't get picked up, I usually end up making some minor gestures myself, such as suggesting we watch a movie and getting something both yummy and festive to eat with it (yes, movie always equals food in this house). So, this year, I'm proposing Mulan with Wei Zhao, and I've bought a lovely little 4-brownie box from Love Brownies - double chocolate and caramel fudge for him, and white chocolate raspberry and salted caramel for me. Yum. I've mentioned them before, and they are still worth every decadent bite. I'm also making a duck, sausage and oat cassoulet (oats, not beans), and putting little heart-shaped cuttings of bell peppers in it. 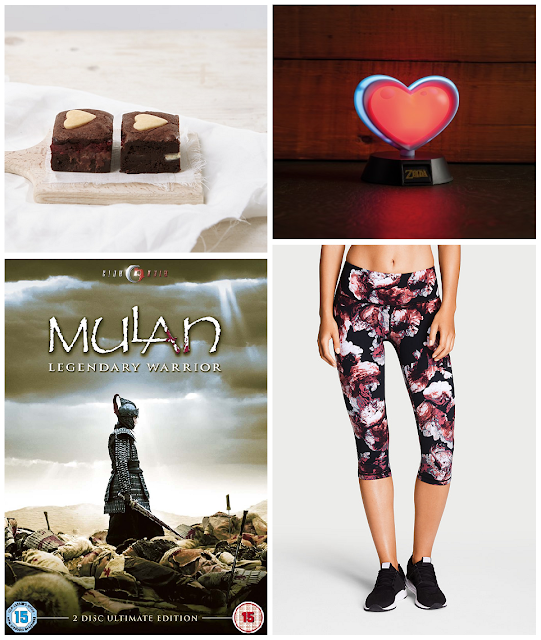 I've been laying hints for the new Legend of Zelda lamps - either the Sheikah eye or the rupee - but in keeping with the Valentine theme, I'm sharing the extra life heart, and also some gorgeous Victoria's Secret gym capris in 'tease floral'. Tell me they're not gorgeous! Anyway, as a final note, I hope you all read my last article, because I really do believe it's important to show yourself some love. We're all guilty of burning out and neglecting ourselves, so whether you're single or not, make some time for yourself on Valentine's Day. You'll be surprised what good it can do you! Valentine's Day isn't just for couples!